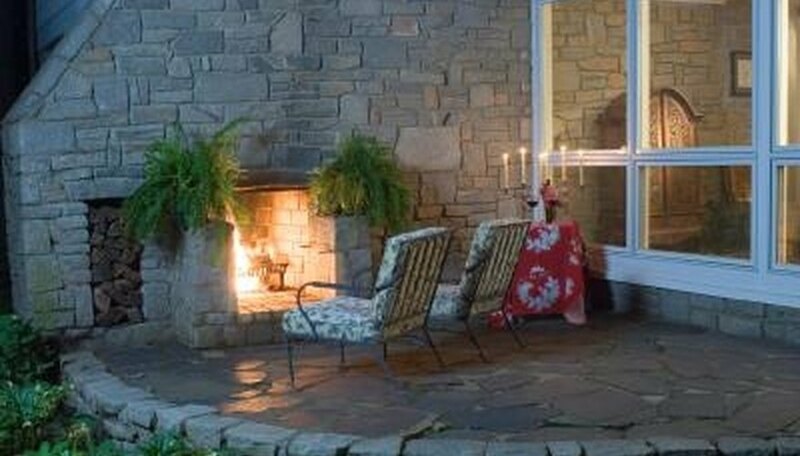 Flagstone patios provide a strong, stylish surface for entertaining and relaxing, but encroaching grass and weeds take away from the look and longevity of the surface. From bricks or stones, to wood or plants, you have a variety of edging options. Choose one that complements your patio and landscape. Installing the edging is a basic process you can complete in a few hours. Once in place, stone edging will not only look good, but will also keep the flagstones from shifting. Decide how wide you want the edging around the patio to be. Insert wooden stakes into the outer corners of the edging and wrap a string around the stakes to create an outline of the edge. Use a flat shovel to remove grass and dirt from the outlined border. Dig the trench as deep as your edging material, plus 8 inches. Lay landscape fabric over the trench to keep weeds and grass from growing beneath the edging. Push spikes through the corners to pin the fabric to the ground. Refer to the planting instructions that come with the seedlings to see how far to space the plants apart, if you're adding a plant border. Gently remove the seedling from the container and place the root in the trench. Use your hand to fill in the trench with top soil, patting the area around plat stems. Cover the new plants with a 2-inch layer of mulch and water with about 1 inch of water every week while the new root systems develop. Pour 6 inches of pea gravel over the trench if you're installing brick or stone edging. Spread the gravel with a shovel until it is level, and then evenly spread 2 inches of crushed limestone or sand over the gravel. Place the stones or bricks in the sand beginning at a corner of the patio. Continue setting the stones so they are flush against each other, tapping them with a rubber mallet until they line up with the flagstone surface. Place a water level over the edging and the flagstone and add or take away limestone from the edging material until the bubble in the level sits between the two center lines. Fill the trench with pea gravel once all of the edging is in place. The pea gravel will prevent weeds from growing through the stones and provide support for the edging.